FILE - Iranian students run for cover from tear gas at the University of Tehran during a demonstration, in the capital Tehran, Iran, Dec. 30, 2017. The White House is calling reports of Iranian protesters tortured or killed in prison "disturbing" and demands freedom for all political prisoners reportedly held in Iran. "We will not remain silent as the Iranian dictatorship represses the basic rights of its citizens and will hold Iran's leaders accountable for any violations," a White House statement said Wednesday. It says the Iranian people are expressing legitimate grievances over government oppression, corruption, waste and military adventurism. "Iran's regime claims to support democracy, but when its own people express their aspirations ... it once again shows its true brutal nature," the statement said. FILE - Protesters cover their mouths after anti-riot police fire tear gas in Tehran, Iran, Dec. 30, 2017. Protests against bad economic conditions, regional military interference and perceived government corruption erupted across Iran on December 28. A number of demonstrators also called for the end of the Islamic Republic, which seized power in Iran in 1979. Some of the marches grew violent, with at least 21 deaths reported. It is unclear how many protesters have been arrested. Reform-minded lawmaker Mahmoud Sadeghi puts the number at 3,700. Iranian officials say most have been released. 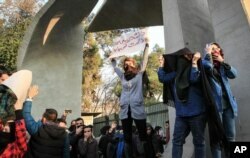 While the Iranian government said the protesters have the right to be heard, it says it will not tolerate violence. Iran's Supreme Leader Ayatollah Ali Khamenei has blamed the United States for instigating the protests and condemned President Donald Trump's tweets that appear to egg on the marchers.